Even as Pittwater Online went to press this morning publication was delayed in monitoring and then sending out or posting Notices regarding flooding in the Narrabeen Lagoon catchment. The last 24 hours saw 92mm of rain fall. Since Thursday, we've seen 254mm of rain. By 6am around 20-30cm of water covered the Wakehurst Parkway but it wasn't until 11 a.m.that Live Traffic advised flooding at Oxford Falls had closed the road in both directions. Further inundations followed, with flooding at Dee Why as well, with warnings to expect delays and extra travel time. 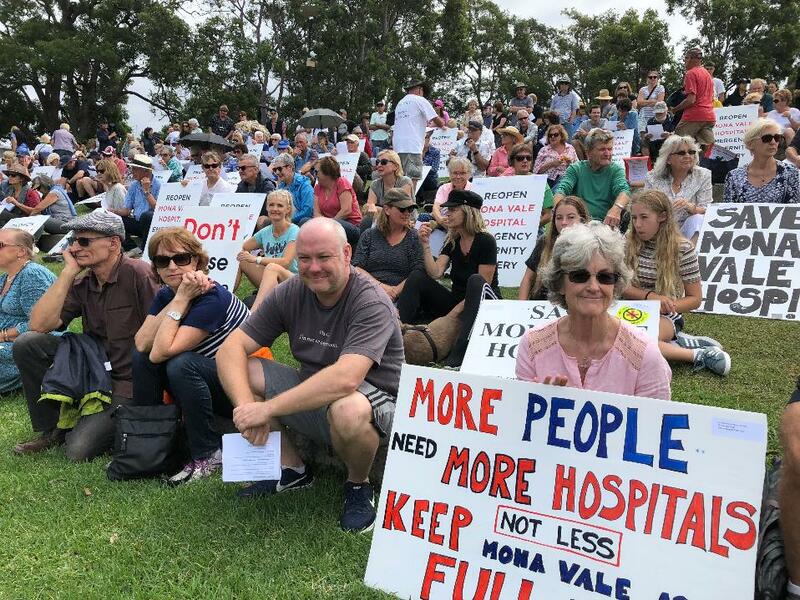 Save Mona Vale Hospital chairman Parry Thomas expressed surprise that a Notice the Parkway was closed took so long to be published given that Saturday night and Sunday morning had teemed until 3.30 this afternoon, Sunday March 17th. The Parkway is still not open and not likely to be with advice that the lagoon will flood further with the 6.30 pm tide, causing further and higher inundations as water cannot run out, and asking residents to move to higher safer ground if their premises are affected. "If it's true, it demonstrates the depths to which our local politicians are prepared to go to hide the reality of the limited access to the new hospital. "This one action puts further puts the lives of our community at risk." he said. “Now, this woman is fine, but given other circumstances there’s a damn good chance that she would not be. Mr Thomas pointed out that the systemic issues that exist at the NBH are part of the reason that we need Mona Vale Hospital reopened with acute services now. “It’s not the only reason,” Mr Thomas told the crowd. “In fact, if the hospital on the hill was perfect we’d still need (Mona Vale Hospital) for the community. Angus Gordon, former Pittwater Council General Manager, told demonstrators about the importance of the facility to him. In one instance some years ago, Aspirin prescribed to him as a blood thinner had eroded the walls of his stomach resulting in severe internal bleeding. An ambulance took Mr Gordon to Mona Vale Hospital where doctors and nurses had tried desperately to stabilise his condition. “(They) used up all of the blood and they had to get more in,” he told the crowd. “By early evening they felt I was sufficiently stable to be transferred to Royal North Shore where I was immediately operated on. “Doctors told me afterwards that it was touch and go and that had I not got to Mona Vale so quickly, and if they hadn’t stabilised me, I wouldn’t have survived. “So I owe my life to Mona Vale. Mr Gordon called on politicians to start listening to and serving the community instead of the “plutocratic parasites” the government was in thrall to. “If we are to have any chance for a democratic future and to give this amazing Pittwater community a chance for a healthy future, we need to make it clear to the politicians that we want true democracy restored,” Mr Gordon said. Community anger over the privatisation of hospital facilities on the Northern Beaches has also been inflamed by revelations from investigative journalist Michael West that Healthscope, with an income of $8.7 billion in Australia over the last four years, has paid no tax here during that period. That was only increased last month when Mr West reported that 43 hospitals around Australia owned by Healthscope, including Northern Beaches, would be taken over by Canadian firm, Brookfield – which already has significant infrastructure holdings in Australia and benefited from an income of $6.9 billion here over the last four years. However, the company also paid no tax here during that period and has a subsidiary in the tax haven of the Cayman Islands. At Saturday’s rally, Friends of Northern Beaches Maternity Services spokeswoman Helena Mooney updated protesters about functioning of the maternity unit at Northern Beaches Hospital. Ms Mooney said basic equipment that encouraged normal births, such as birthing mats and balls, were unavailable. Whilst Mona Vale Hospital had a total Caesarian section rate of 29.8 per cent, NBH’s private operator, Healthscope, had much higher C-section rates at its other private hospitals, including 55 per cent at Prince of Wales Private. “We are very concerned that intervention rates will be increased for women going through the public system at the Northern Beaches Hospital,” Ms Mooney said. “We believe this to already be the case, but as Healthscope have not made their statistics readily available for review, we cannot yet confirm this. Ms Mooney condemned the closure of acute public hospital facilities on the northern beaches and the opening of the new for-profit hospital, now being sold offshore. “We cannot let this continue. We must hold our politicians to account,” she said. A lighter mood took hold during the running of an egg and spoon race at the rally, with competitors strapping on prosthetic pregnant bellies. Making a serious point, heats ran along a simulated route to the new hospital at Frenchs Forest past Mona Vale Hospital, to Wakehurst Parkway only to be diverted due to flooding. Earlier, local band The Rions played a set, including what has become the Save Mona Vale Hospital anthem: a rewritten version of Let It Be. A number of protesters during an open mike also recounted their experiences at the hospitals and fears of being unable to secure timely treatment. Mr Thomas closed the event saying he had never intended the hospital campaign to be a political fight and he was not rusted on to any political party. However, politics should be about delivering to the community you represent, he said, and called on Pittwater residents to send the Liberals a message with their vote at the state election next week. Pittwater Liberal MP Rob Stokes had really dropped the ball on the hospitals’ issue and that of council amalgamations, Mr Thomas stated. “We don’t have any desire to tell you who to give your votes to,” Mr Thomas said to loud applause. “However, what we want you to do is number every box 1 to 8, in the order of your preferences. “And what’s really important in this message is that in number 8, you put the Libs.” Mr. Thomas said.